Due to the threat of the Goldspotted Oak Borer spreading throughout San Diego County, no oak firewood will be allowed into Palomar Mountain State Park. To find out more about this pest, go here. Gathering of dead wood or other plant material is not permitted. Wood can be purchased at the park or you can bring other species of firewood, such as pine, eucalyptus, avocado, orange, etc. INDIVIDUAL / FAMILY CAMPSITES There are 31 campsites in the Doane Valley Campground, three of which have accessible features. Each site has a table and fire ring, and most have a food locker. Piped drinking water is available. The campground also has restrooms with flush toilets and hot showers which are usable for campers with disabilities. GROUP CAMPSITES The Cedar Grove Group Campground includes three separate areas with one accessible site and restroom. 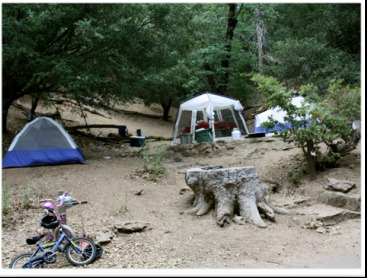 Group Camp number one will accommodate up to 25 people; the others will accommodate up to 15 people each. Group Camp number one will accommodate trailers and camper vans up to 21 feet in length; the other group camps are suitable for tent camping only. Parking is limited. RESERVATIONS: Campsites can be reserved up to six months in advance of arrival by visiting ReserveAmerica.com or calling 1-800-444-7275. From outside the USA, call (916) 638-5883. Persons with hearing impairments can call the TDD number: 1-800-274-7275. PEACE AND QUIET: Some folks come here to “get away.” Please observe the quiet hours of 10:00 p.m. to 6:00 a.m. No generators from 8:00 p.m. to 10:00 a.m.
OTHER CAMPING NEARBY The U.S. Forest Service operates two campgrounds on Route S6, a few miles past the turnoff to the park: Observatory Campground and Fry Creek Campground. For information regarding these sites, Google them or contact the Palomar Mountain District Office, Goose Valley Ranger Station at (760)788-0250.